Grace shining forth from your lips like fire hath enlightened the universe. It has shown to the world the riches of riches poverty; it has revealed to us the heights of humility. 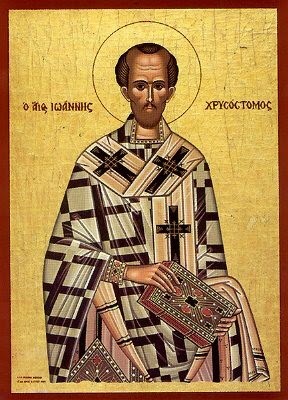 Teaching us by your words, O Father John Chrysostom, intercede before the Word, Christ our God, to save our souls! Having received divine grace from heaven, with your mouth you teach all men to worship the Triune God. All-blest and venerable John Chrysostom, we worthily praise you, for you are our teacher, revealing things divine! Apostolic Succession: Is it True? We Have Met the Enemy. . .
Joshua S. Treviño confronts the Internet. Unless otherwise noted, all written material on this blog is copyrighted by the blog owner. All rights are reserved.